Cheese tea? Yes, I wrote that correctly and you read it correctly. 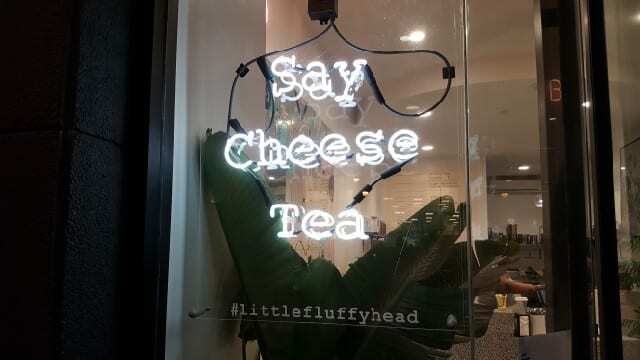 Little Fluffy Head is a tea shop located in downtown Los Angeles and they specialize in cheese tea and it is the Please The Palate pick of the week. It really is hard to image cheese and tea being mixed together. But, the trend was started in China and is popular throughout Asia. While it was questioned by many at first, apparently people line up for hours to get a cup of cheese tea in Asia. In the fall of 2017, Little Fluffy Head was opened by owner Jenny Zheng in downtown LA to offer cheese tea to Los Angelenos. So, what is cheese tea? You may be thinking of a chunk of cheese placed in a cup of tea, at least that is what I had first envisioned. In fact, cheese tea consists of a thick layer of creamy cheese foam that is sweet and salty, paired with a refreshing sweet tea. The cheese topping is made fresh daily. It is a mix of cream cheese, milk and whipping cream with salt added for a sweet and salty flavor. There is also a cheese cream made with mild cheddar cheese. The tea is brewed fresh and choices are jasmine green tea, light oolong tea, medium oolong tea and black tea. Premium tea choices are rose oolong, osmanthus oolong, lychee oolong and peach oolong. All of these teas come with the cheese whip on top. 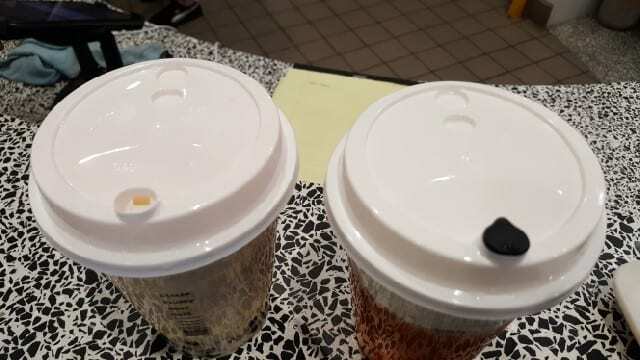 I chose the jasmine green tea and was impressed with how the cheese whip added a savory note to the refreshing floral tea but did not overpower it. Milk teas are also available with the cheesy topping. There is the Dirty Mess Milk Tea with black milk tea with creme brûlée cream and crushed Oreo topping that is actually not too sweet, as I had expected. But the Sweet Ginger milk tea has a lovely sweetness that is not cloying but rather refreshing. To drink cheese tea, it is not suggested to stir the tea nor recommended to use a straw. The key is to taste both layers – the cheese and the tea. 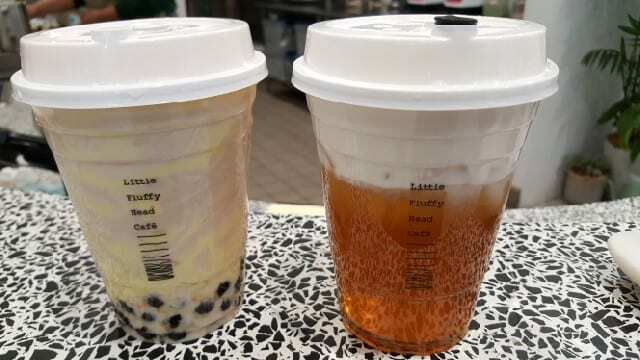 Little Fluffy Head has created a customized sippy-cup with the idea that if you drink it at a 40-degree angle, you will get the perfect sip of both tea and cheese whip. Cheese tea may seem like an unusual combination for traditional Western palates but it is actually quite tasty with the cheese adding a richness but not overpowering the tea. This entry was posted in Food and tagged Cheese tea, Little Fluffy Head, pick of the week, Please The Palate, tea by Allison Levine.